Be sure to check out our partners! Bain & Associates Court Reporting Service, Inc. - Do you need a court reporter and videographer as well? We are statewide with offices in Huntsville, Birmingham, Montgomery and Mobile. Welcome to Birmingham Videoconferencing Center! We are conveniently located downtown, in the heart of Birmingham at the Financial Center: 505 20th St. North, Suite 1250, Birmingham, AL 35203. Just one block from the Jefferson County Courthouse as well as one block from the Federal Courthouse. 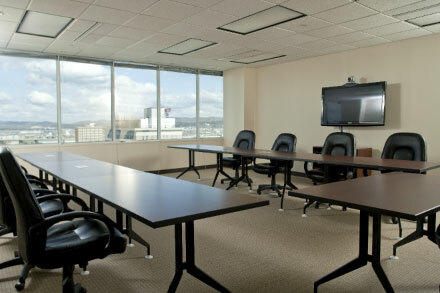 We offer spacious conference rooms and Polycom technology to service your needs! We have other locations in Huntsville, Montgomery and Mobile, plus we can schedule your videoconference anywhere in the United States! Don't hesitate to give us a call so we can pass our Network Discounts on to you as the customer! Let Us Book Your Next Videoconference! "A Division of Bain & Associates"